Paper Dolls is a band of 4 Alaska Grown Sisters: Kendra, LaRae, Alisa and Meghan. In their 11 years of touring, they have amassed upwards of 3,000 shows in almost all 50 states. They have written and recorded with the industry’s best in Music City, TN, including Paul Worley. Thei rvaried background has given them a unique sound that nods to the past while being curent and fresh. 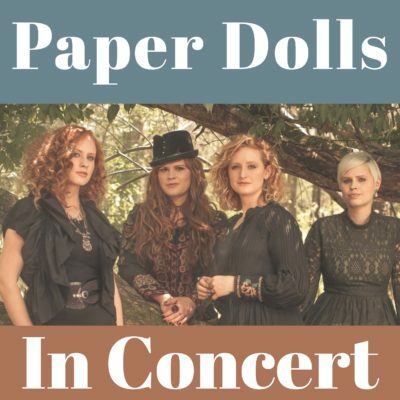 You are invited to see Paper Dolls in concert at Berryton United Methodist Church at 3 and 7 p.m. on Saturday, August 3. There will be food and snacks available for a freewill donation and a love offering received for the artist. Would you like to share your time to help make the concert happen? Sign up to serve on the clipboard on the Welcome Table outside the sanctuary or contact Ken and Darlene Sutton at santaken@aol.com or djs1950@hotmail.com.